It’s a new year and for any business, getting organized needs to be the number one priority. Sure, in a perfect world, businesses and their employees would be organized all year round but that isn’t really realistic. In honor of National Clean Off Your Desk day, which was celebrated January 11th, we spoke to experts who dedicate their life’s work to helping you clean off your desk and get organized. Let’s face it; when you are more organized, you are more productive, and when you are more productive, you make more money. And what business would have a problem with that? Friel works with a lot of clients who are all struggling with the same things, getting organized and staying that way, and in her experience, one of the biggest roadblocks individuals tend to experience is getting overwhelmed at the amount of clutter and the steps they will need to take to get organized. “People are overwhelmed with too much stuff, too much to do and not enough time, “Friel said. To combat that overwhelming feeling, she suggests starting in the spot that is causing you the most stress. 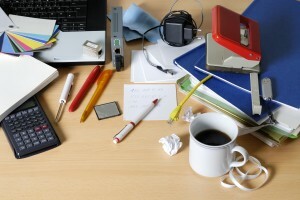 Whether it be your messy desk or your cluttered junk drawer, break it down into simple, doable steps so the entire project won’t seem so massive. People feel so much better once they have a sense of order, she added. If you want to turn your new found sense of office organization into a lifetime habit, Friel said it is as simple as forming healthy organizing habits. She suggests one example is to carve out 10 minutes at the end of each day to get your papers and files back in their right place. For more information on space saving in the virtual space, visit Devon IT’s website and check out our small, yet powerful thin clients.